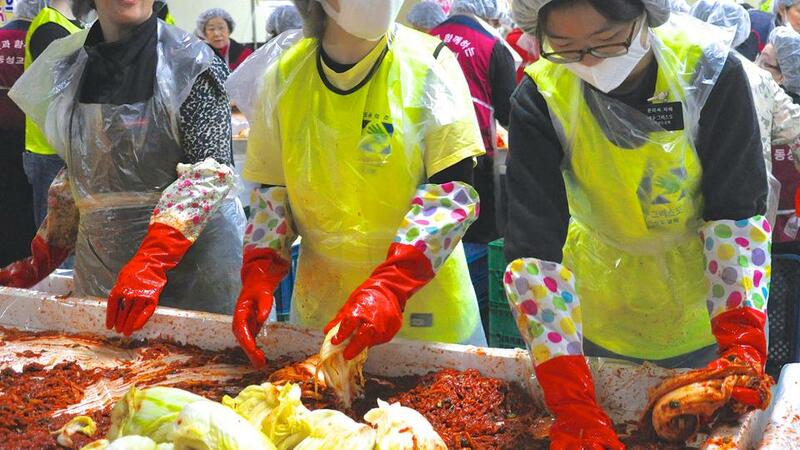 Recently members of the Church of Jesus Christ of Latter-day Saints partnered with the Korean Red Cross, Yongsan City, and other churches to make kimchi for the needy. 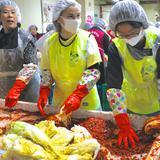 This service activity, which was held in Yongsangu on November 17, used the theme “Citizens of Yongsan: Sharing and Caring by Making Kimchi”. 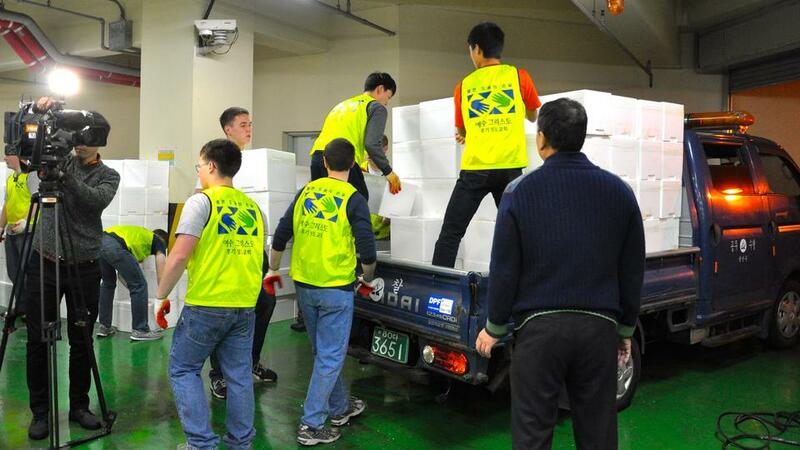 “We are always happy to have our missionaries participate in these types of Helping Hands projects,” said Brent Christensen, President of the Seoul Mission of the Church who donned a yellow Helping Hands vest with his wife and joined 65 of his missionaries at the event. 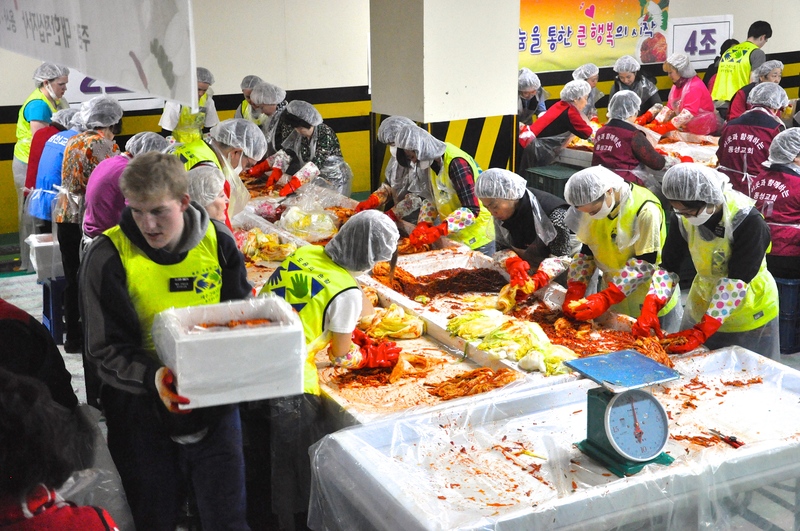 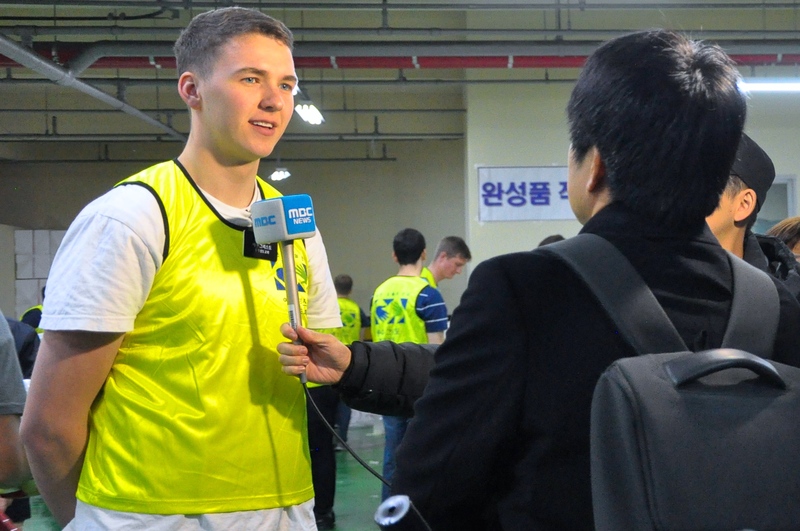 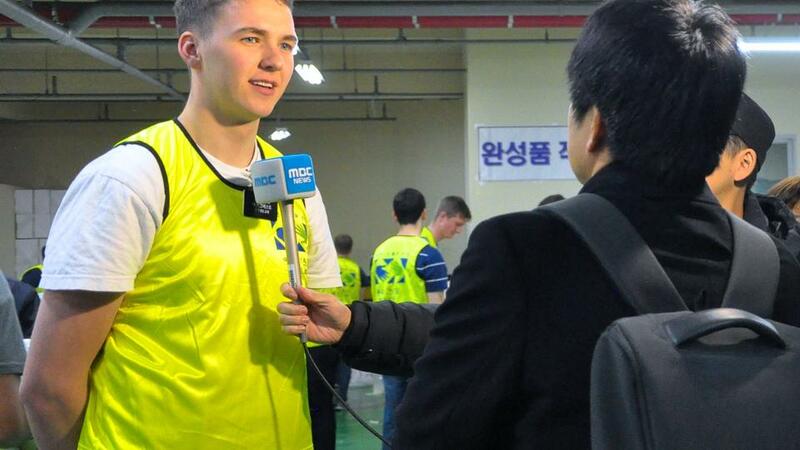 In addition to the 65 LDS members and missionaries, approximately 130 other Yongsan area volunteers from the Red Cross and other churches joined together at a converted underground parking garage near Seoul Station to make over 15,000 kilograms of kimchi from thousands of heads of cabbage. 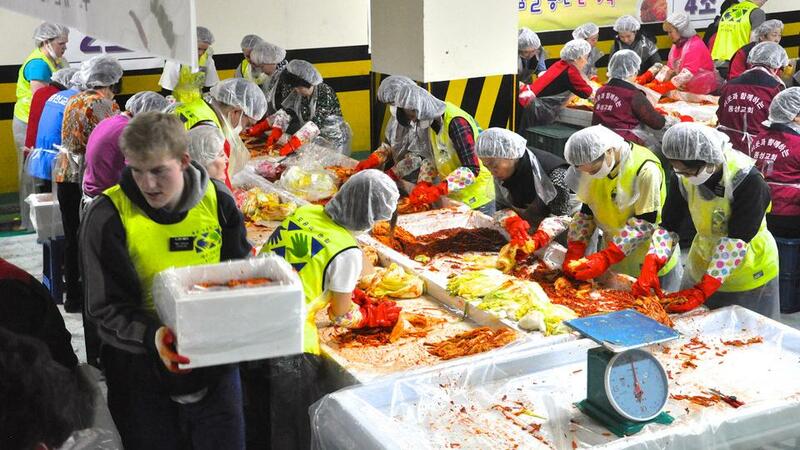 1,500 large boxes were packed and sealed with fresh kimchi before being loaded onto delivery trucks bound for food banks and storage centers. 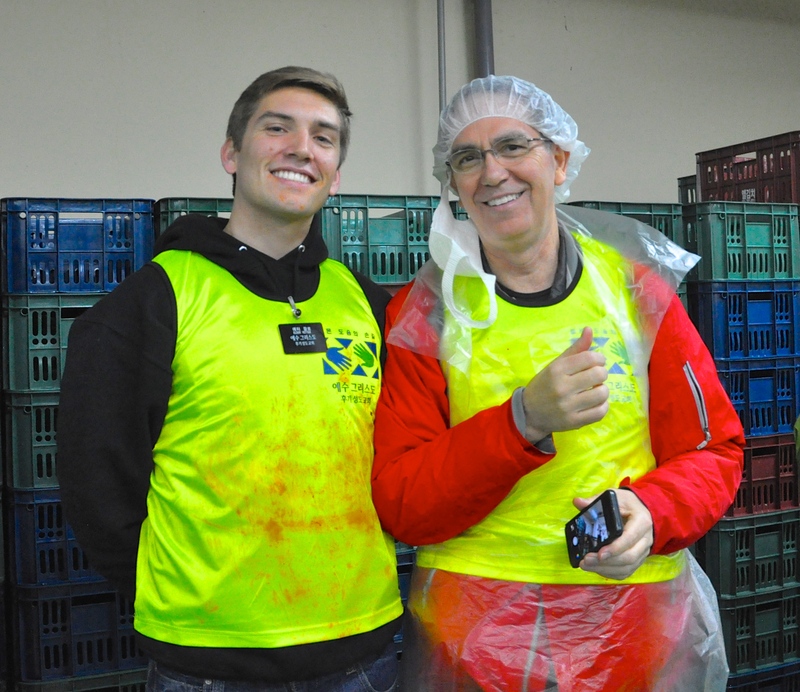 The Mormon Helping Hands program brings together members of The Church of Jesus Christ of Latter-day Saints and their neighbors to provide community service. 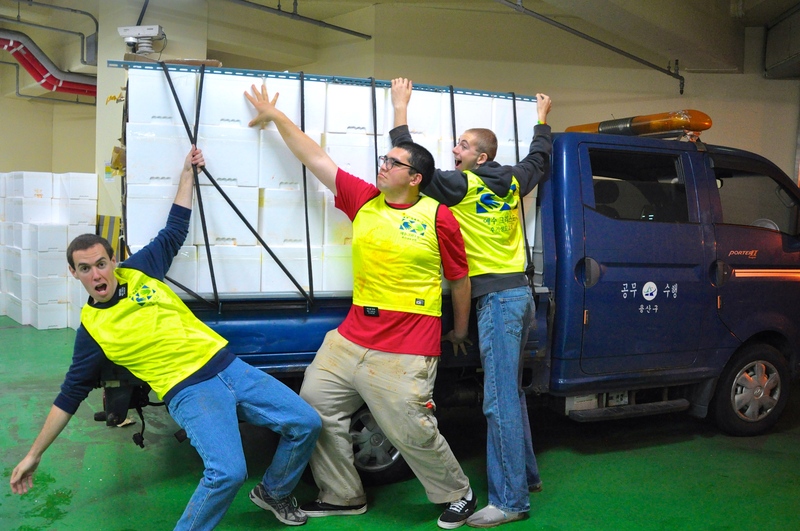 These volunteers in their trademark yellow shirts often help people whose lives have been affected by natural disasters and other emergencies. 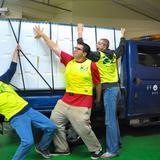 Mormon Helping Hands volunteers also partner with government and nonprofit organizations, such as the Red Cross, to support and improve the communities where they live. 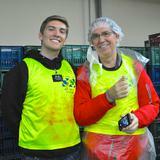 The Helping Hands program reflects the desire of Mormons to follow the example of Jesus Christ by serving others. 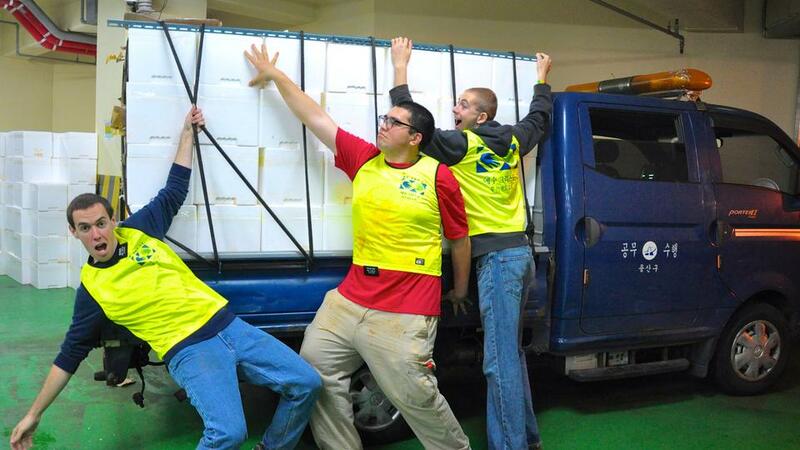 The effort receives resources from Church humanitarian services, and the projects are coordinated by local Church leaders. 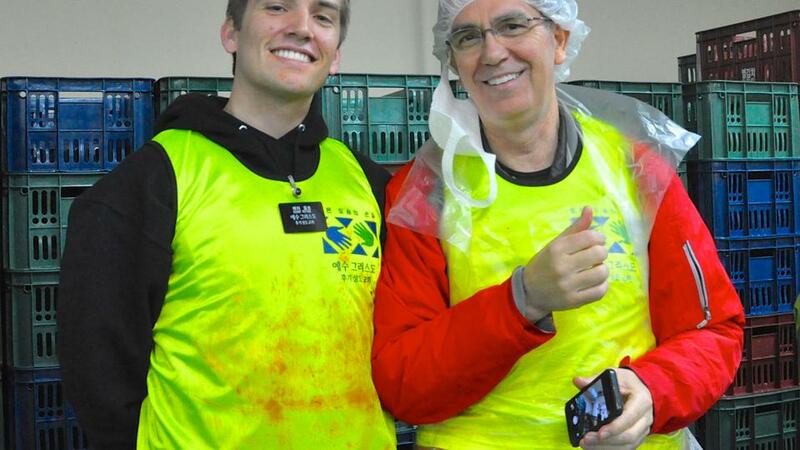 One volunteer summed up the feelings of many who participate in the Mormon Helping Hands program: “We find real happiness when we think outside of ourselves. 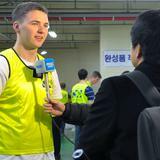 That is true joy,” he said.